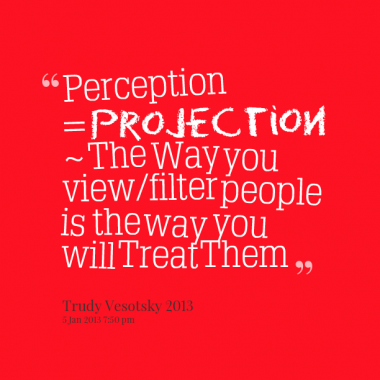 CREATE A VOICE Blog-ver-sa-tions: #WisdomWed.. How do you want to be Perceived? #WisdomWed.. How do you want to be Perceived? Today you decided to wear odd matching clothes, with your hair un-groomed, bare-foot wearing flip flops or sandals with socks! With the least bit care who sees you shopping, at work and/or just around the neighborhood. For the moment this is your projection. So ask yourself, "How do you want to be perceived?" Everyday we project a perception to tons of people, online and in public. Most people take the time to cover obvious faults with make-up, high end clothing, and the use of articulate speech. Suggesting we are not ignorant, we have wealth and are simply desirable. True appearing attractive, having the latest and the ability to communicate clearly does build perception, but what is the true essence describing your inner being. (1) Being an African American, sometimes it's hard to perceived what we are about. Our history records us as founders of righteous global societies, originators of the Arts/Crafts and leaders of civil movements defending mankind's right for dignity. It seems we have forgotten our history, allowed the Arts to photograph and compose negativity into our entertainment and consciousness, and the wealth of successful progress has distracted some vital leadership with the boasting of their riches...How are we perceived? (2) Did you know an online profile, represents your psychological interests and moral values. A posts generates likes accordingly to its context, whether positive or negative. If an adult is consistently posting or having what's perceived as immature content; it plainly describes their present state. "Birds of a feather flock, together" and Yes, these are friends and family we are associated with. Even so, if the postings are mature with good intentions; the person is perceived as too religious, serious or a motivating person... How are you being perceived? A not to mention, a large percentage of youth live in foster care, are failing in school, and are living vicariously through the false reality of pop culture. Whether it's a lack of training, self esteem issues or just no consideration for public conduct; the question is, How are us as parents and guardians being perceived? One's behavior is perceived by his/her actions, based by their intentions. If we do not educate ourselves and/or inform one another about social conduct, then who will? Answer: Law Enforcement, a Therapist, consistent incarceration, no social life or the inability to keep employment. Upon posting content for online conversation. Let us first, contemplate what type of profile we are creating for potential employers and others to view. Many people have fought, declared and established a history of righteous behavior; to benefit their legacy and generations to come ~ Act like you know! There many children in foster homes, have empathy for their struggle. Many parents are single and trying their best, ask for help or counseling for personal development. Communicate more with our youth, understand these new times they live under. Create incentives that will merit good behavior, and teach them there legacy for self esteem and confidence. 1. Become aware or conscious of (something); come to realize or understand. 2. Become aware of (something) by the use of one of the senses, esp. that of sight.